Environmental Sciences-Biology student Aubree Hill is working to develop a treatment for amphibians infected with a deadly fungus called Batrachochytrium dendrobatidis (Bd). 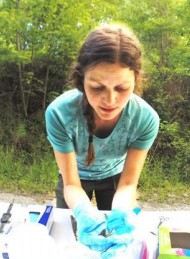 She is specifically researching the salamander microbiome—or community of naturally occurring bacteria on the skin—and whether it can inhibit or eliminate growth of the fungus. 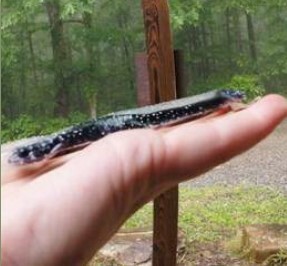 Aubree and her team captured, swabbed and released more than 350 salamanders this year. They then isolated the bacteria from the swabs and challenged them against Bd to determine their ability to inhibit fungal growth. These so-called candidate probiotic species may then be recommended for therapeutic treatments of infected amphibians. Aubree also hopes to gain a better understanding of the structure of the amphibian skin microbiome as a whole and whether it varies across taxonomic groups of salamanders, habitat types and seasons. She will use TTU’s new Illumina MiSeq DNA sequencing instrument to help make these comparisons. Aubree recently presented her research on the salamander microbiome at the Tennessee Herpetological Society annual meeting in Knoxville. Her advisor is Donald Walker.